September arrived with a forecast of intense rains, hurricanes and the possibility of another presidential trial in Guatemala. If it’s not a political crisis than it’s a natural disaster. Nonetheless, the work and commitment of CAMY Fund’s grantee partners did not stop. It was nice to meet (for me) and reunite again (for Emily) with young leaders who are doing wonderful things for and with their peers in a complicated climactic and sociopolitical context. 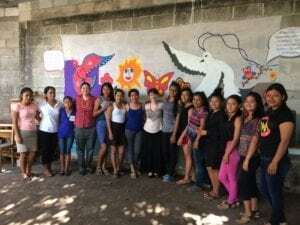 We were pleasantly surprised by the four grantees along the way: Asociación AMA in Petén, GOJoven Guatemala in Antigua, Women’s Justice Initiative in Patzún and Asociación COINCIDIR in Jalapa. We started our journey in Petén with Asociación AMA. Recently, and in the context of the Prevention with Education Agreement 2016-2020, Asociación AMA helped to consolidate the Departmental Working Group on Comprehensive Sexual Education in Petén, a department that is best known for having the largest forest reserve in Guatemala, but in matters of sexual and reproductive rights has not received the same attention. During our visit there was a national teacher’s strike which forced us to change the venue of the meeting with officials from the Peten Ministry of Education (MINEDUC) and the Ministry of Public Health and Social Assistance (MSPAS). At the meeting, we were pleased to see a strong interest for the implementation of Comprehensive Sexual Education (CSE) by Mr. Amílcar Rolando Corzo Márquez and Lic. Gloria Catalán Puga of the Ministry of Education, as well as by Dr. Roy Flores, Dr. Luis Salvador Méndez Castellanos and Lic. Rosalinda de Colmenares, Directors within the MSPAS in Petén. We also found out that for the 900 schools in Petén only 70 printed materials on CSE were distributed, which means that most schools do not have the means to teach this subject. In this sense, Asociación AMA’s training in CSE for primary school teachers in Petén and monitoring of their classroom sessions, in partnership with the Ministry of Education, are an invaluable contribution. We visited the radio station U T’AN KAJ The voice of the Poptún people, Petén 106.9 FM – where Emily gave two interviews that you can listen to here (in Spanish) and here (in Q’eqchí and Spanish). 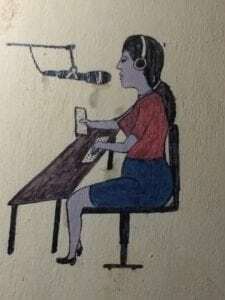 Asociación AMA has a weekly radio program at this station, “the ABC of Sexuality,” which is in Spanish and Q’eqchí and aimed at young people and their parents. It was inspiring to meet young men and women between 14 and 24 years of age, from diverse communities and ethnic backgrounds, who enthusiastically shared what they learned in the training camps organized by Asociación AMA about sexual violence, gender norms and youth entrepreneurship. We ended the day by giving a monitoring and evaluation workshop to the Asociación AMA team as part of the technical assistance provided by the Fund. The CAMY Fund recognizes the solid work that Leslie has carried out and we continue to support her in seeking the commitment of more young people, teachers and community leaders with Comprehensive Sexual Education and the prevention of teenage pregnancies. The second stop was with the project leader, Joseline, and the entire GOJoven Guatemala team in Antigua. Joseline has formed an impressive team of five delegates in Alta Verapaz, Chimaltenango, Totonicapán, Sololá and Izabal. These leaders are committed to eliminating forced unions in their communities through the establishment of multi-sectoral working groups to develop and implement action plans at the municipal level. Joseline shared the recently approved Decree 13-2017 which sets 18 years as the minimum age for marriage, without any exceptions. This recently approved reform brings the issue of child marriage back to the public eye and provides an opportunity for GOJoven Guatemala’s campaign, #NoForcedUnions (#NoUnionesForzadas), to gain more strength in the country. GOJoven Guatemala continues to professionalize their work and on this occasion the Fund contributed with a workshop on developing project proposals. Through sun-drenched and abundant landscapes we arrived at the offices of Women’s Justice Initiative (WJI) in Patzún, Chimaltenango. On the way to the community of Xetzizí, Sandra, the project leader, showed us one of the strategies developed by community leaders as part of their action plans: posters to prevent early unions located at youth gathering points. “Young people read the posters while passing by or waiting, and something will stay with them after they read the message” says the mayor of Xetzizí, convinced of the positive impact of this strategy. We also visited a girls club session facilitated by Delfina, a young leader at the organization, where they discussed relationship violence, how to identify signs of violence and the importance of getting to know the other person before making a bigger commitment. 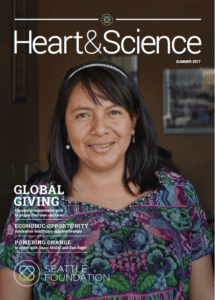 Notably, Elvia Raquec, one of WJI’s team members, was on the cover of The Seattle Foundation’s recent issue of Heart & Science, published in July of this year. You can read the article here. We ended the trip with a visit with project leaders, Benilda and Mildred, as well as the entire Asociación COINCIDIR team at their Adolescent Development Center in San Luis Jilotepeque, Jalapa. Not only did we see solid advances in the community census they are carrying out but also technological innovation to input information and share it in real time with everyone through geomapping. 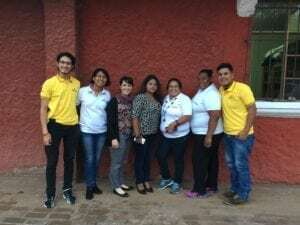 Sandra Cocón of WJI recently provided Asociación COINCIDIR with a workshop on carrying out a community census as part of a healthy exchange between grantee partners. We also spent time with leaders of the Adolescent Girls Coordinating Body – a group of 18 girls between the ages of 14 and 19. I was glad to hear of their plans and enthusiasm for their work as part of the Coordinating Body, where they have managed to obtain a favorable response to some of the demands they made of the current mayor when he was a candidate. Guatemala’s national political context is uncertain, but there is no doubt about the quality of the achievements obtained by Leslie, Joseline, Sandra, Benilda and Mildred, their teams, local government allies and other NGOs, and how their strategic work has contributed to young people’s development by strengthening their leadership and non-violent relationships in these communities.